There have been two books sitting on the shelf in my office for as long as I can remember. 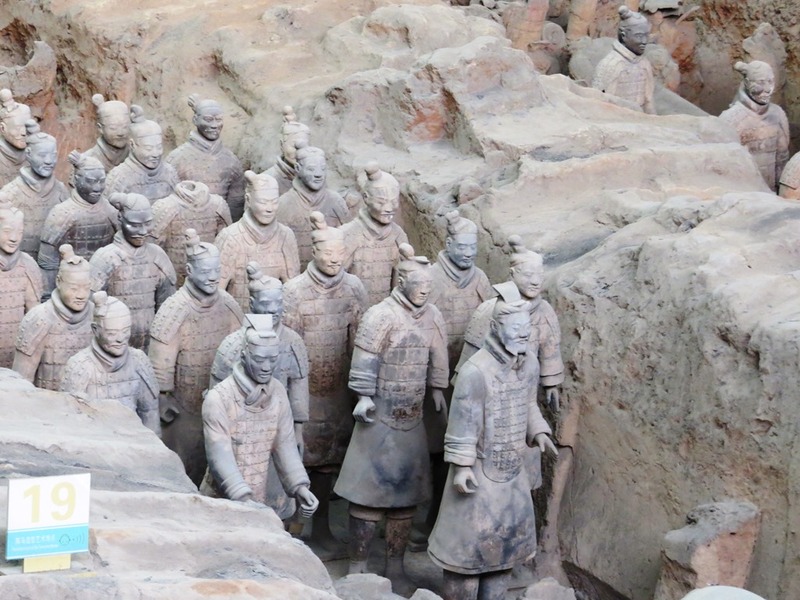 They are picture books about the Terracotta Army of Qin Shi Huang, the first Emperor of China, constructed to serve the Emperor in the afterlife and buried around the time of his death in 210 BCE. The books I’ve had are children’s books, but at the time I became interested in the Army, there really weren’t any other books I could find on the subject. I took a lot of pictures. This will be a long blog post. As always, you can click on individual photos to see them larger. 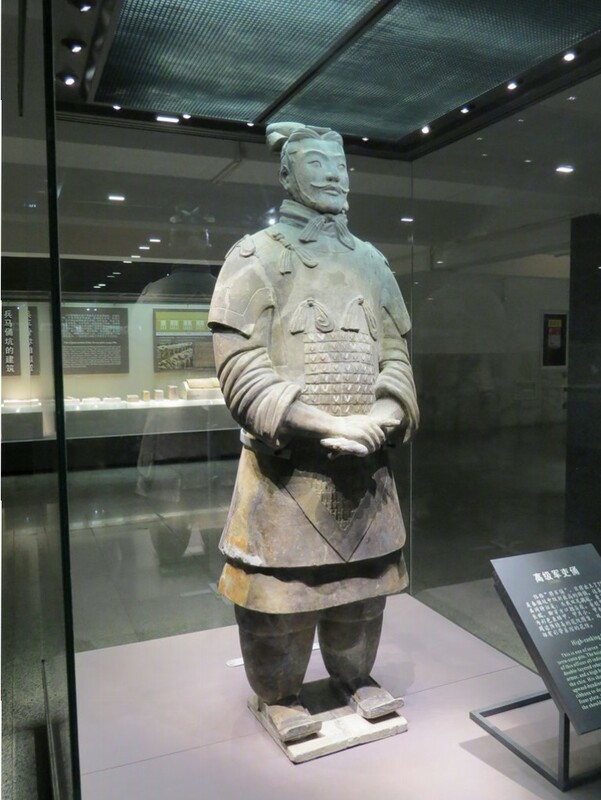 But before we begin, let’s talk about what the Terracotta Army is, and its history. 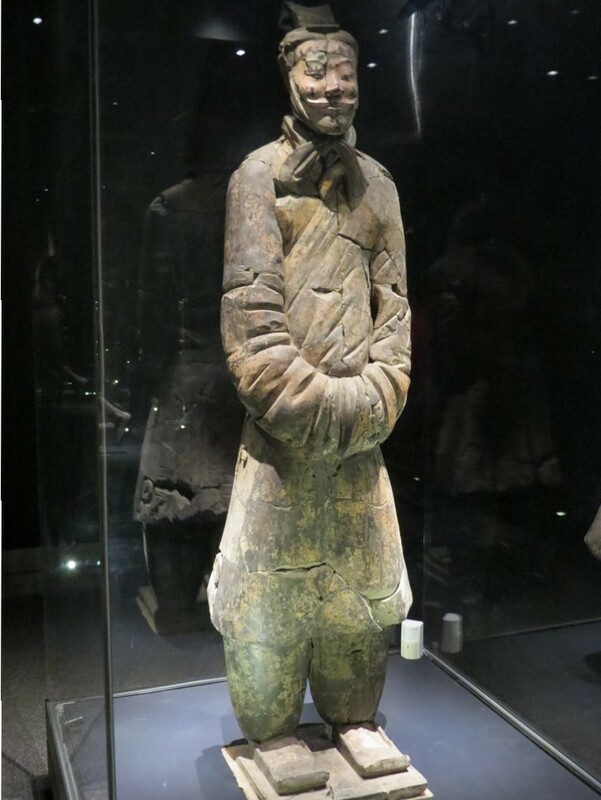 On March 29, 1974, a group of farmers digging a water well in Shaanxi Province in China, not too far from Xi’an, came across a life-size and obviously very old figure of a soldier, made of fired clay (terracotta). They notified the authorities, who sent archaeologists to the site. 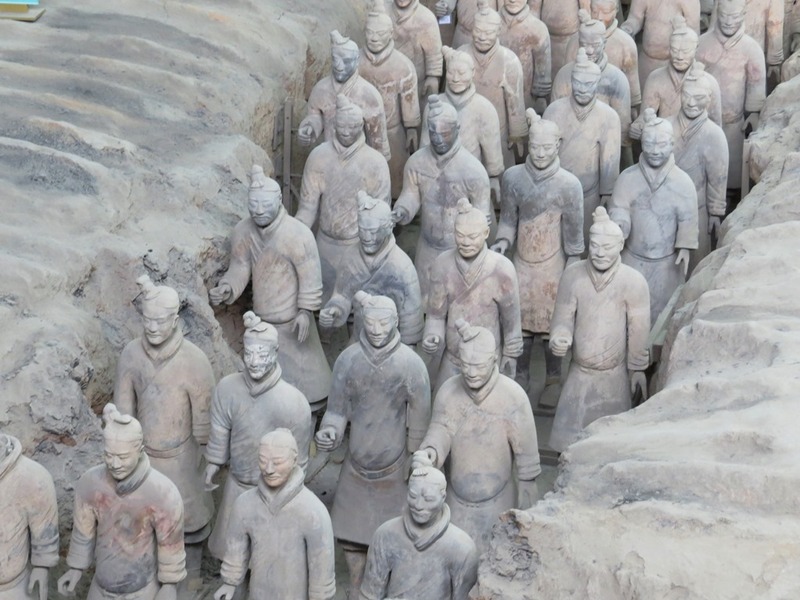 The scientists soon determined that there was not one figure, but many — to date, it is estimated that there are probably some 8,000 terracotta figures, most still buried and in pieces. 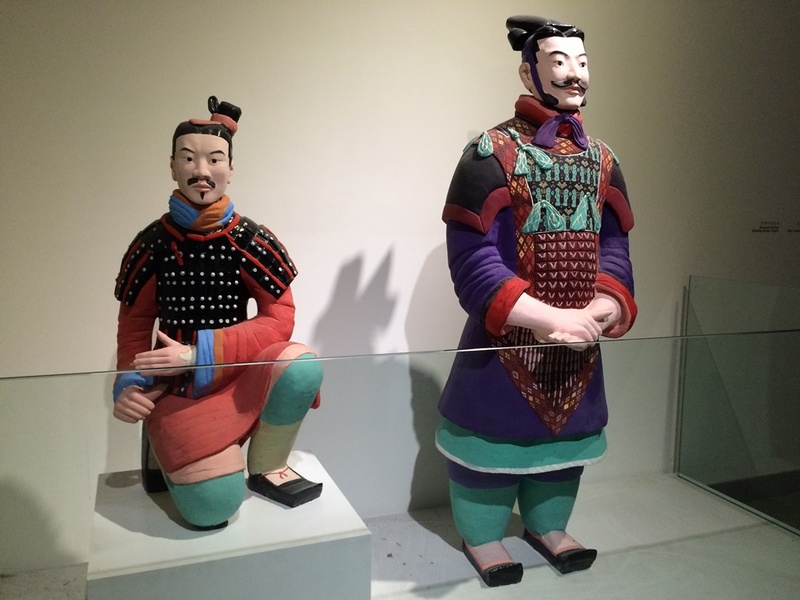 As noted, these figures were fashioned as part of the mausoleum of Emperor Qin Shi Huang (260-210 BCE), the first leader to unify the various warring states of China into a single country, which happened 221 BCE. What is quite amazing is that nobody was aware that this massive collection of figures even existed. 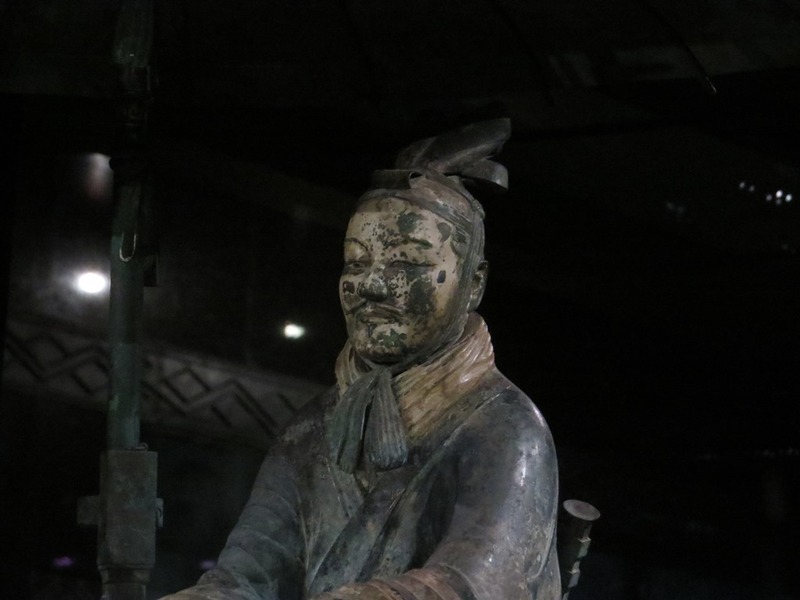 It is not as if Qin’s funeral complex was unknown: the Chinese historian Sima Qian (145-86 BCE) wrote about the massive funeral preparations for the Emperor, which apparently began in 246 BCE soon after Qin ascended the throne. 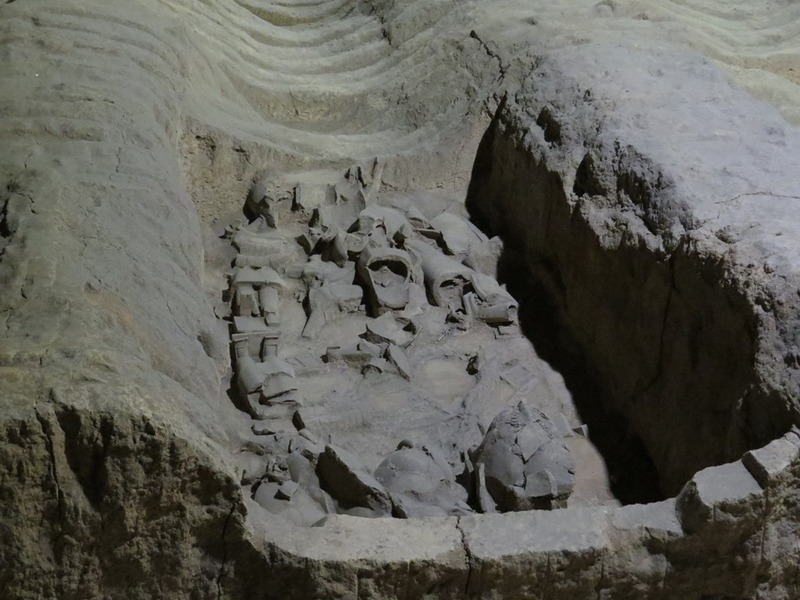 The mausoleum reportedly required 700,000 workers to build, and the burial mound of the Emperor itself is said to contain a model of the Chinese empire, with rivers made of mercury. (In fact, tests around the burial mound showed high levels of mercury, lending credence to the claim.) 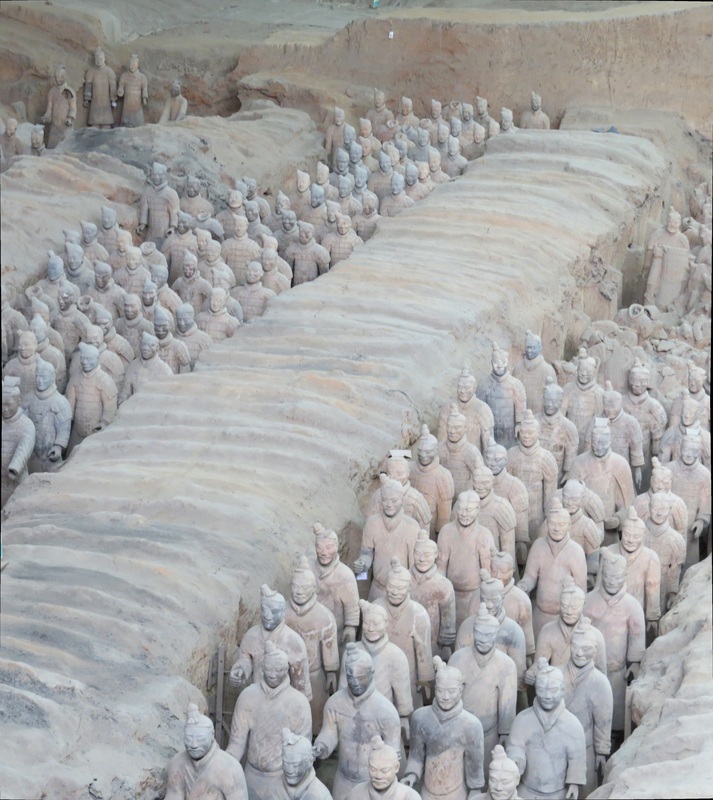 But there is no mention in history of the massive Terracotta Army, which made it a particularly big surprise when it was (re)discovered. 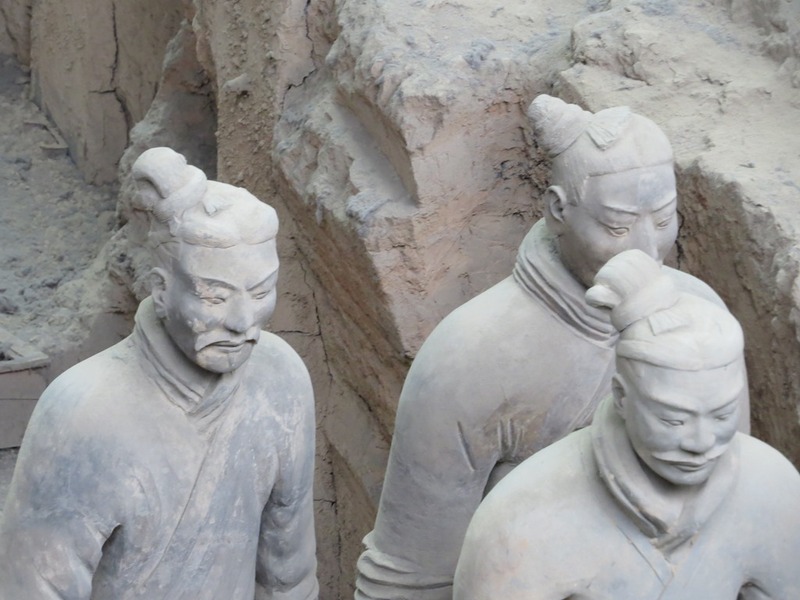 Four pits for the army have been discovered, though the fourth was found empty, representative of work left incomplete after the Emperor died and his empire collapsed into chaos again. 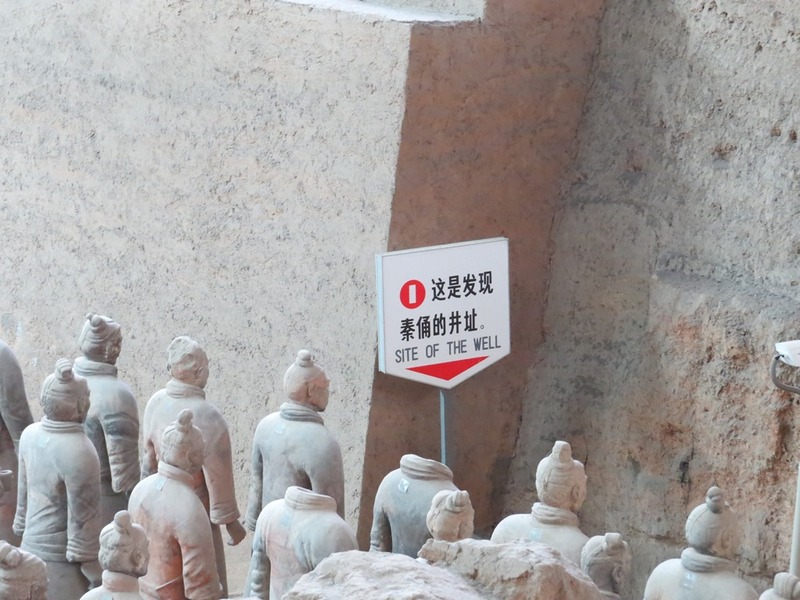 The pits are, curiously, about a mile away from the mausoleum of the Emperor. 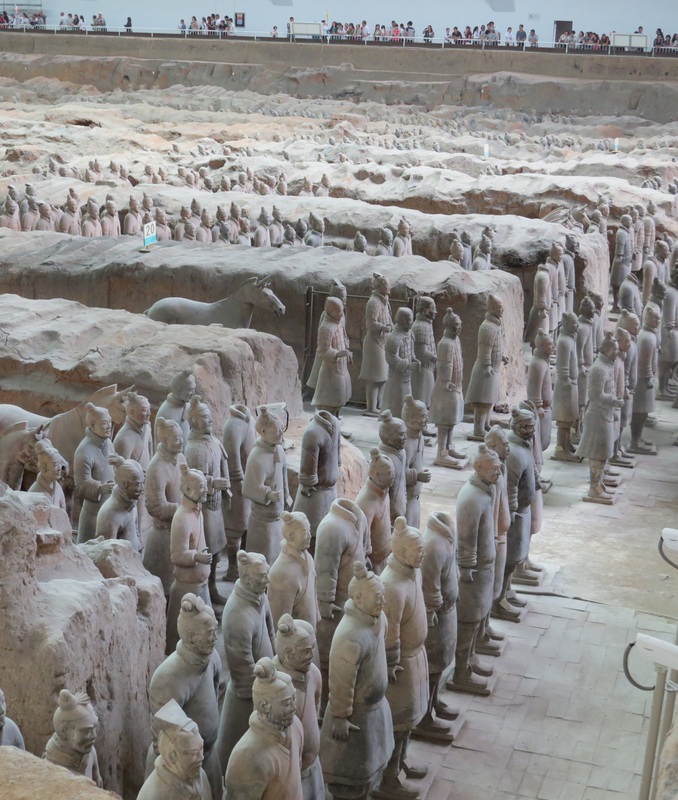 Originally, all four pits were covered by wooden ceilings, though all collapsed — either due to time or deliberate destruction — and the warriors within were entombed in hard-packed earth. 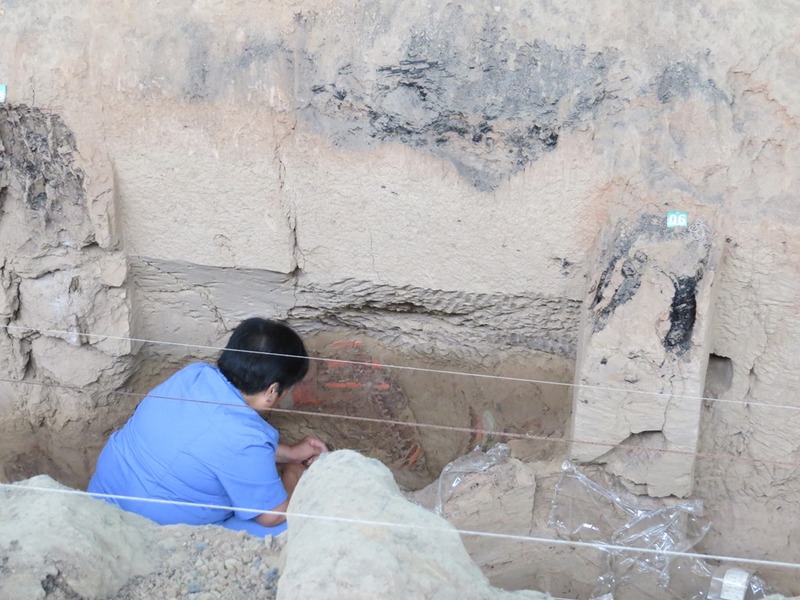 Excavation and reconstruction of the figures, as we will see, is a painstaking process, and having seen the extent of the archaeological dig, I would not be surprised if it takes another hundred years to reconstruct the Army as fully as possible. But, anyway, onto the photos! I went to visit the Army with my former postdoctoral advisor Taco and a pair of Chinese students who graciously came along to help. Due to road closures, it took us about 2 1/2 hours to get to the site. 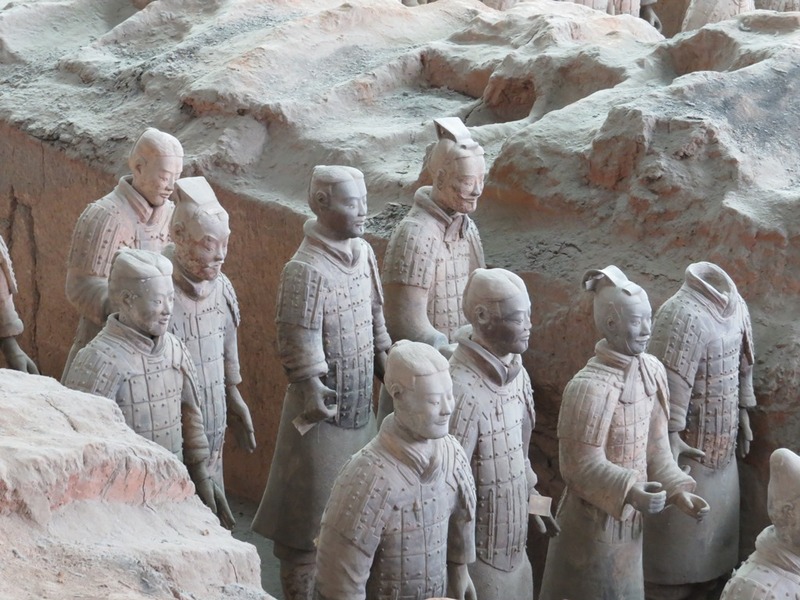 I was a little nervous on the whole ride there — would I really be seeing the legendary Terracotta Army after all? At last, we purchased our tickets and arrived at the gate of the complex. I should note all the parasols — Chinese women usually carry them as shade from the hot sun. And it was hot during my trip to China; I suspect my hosts thought I had some sort of horrible fever from the amount I was sweating. 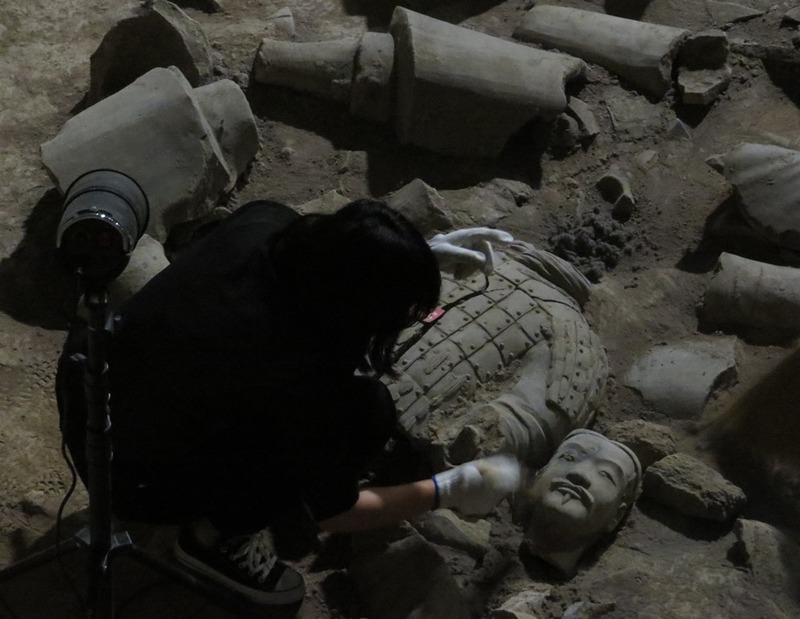 The Chinese government knows a good thing when they see one — it was immediately clear that immense resources had been dedicated to protecting and displaying the Terracotta Army, even though it remains an active archaeological excavation. Massive, beautiful buildings have been built to house the pits, as can be seen below. Panorama of the Terracotta Army complex. 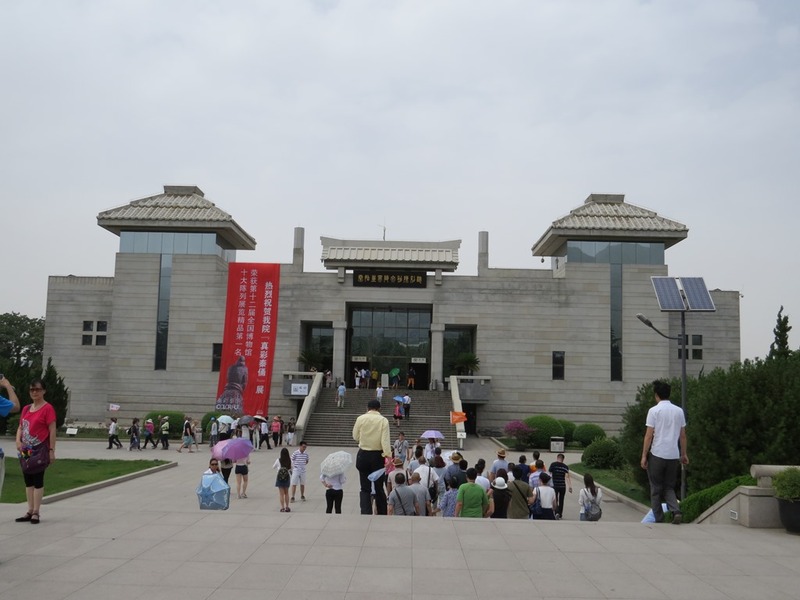 The curved building on the left houses Pit 1, the middle building houses Pit 2, and the rightmost building is a museum. The building for Pit 3 is behind Pit 2. 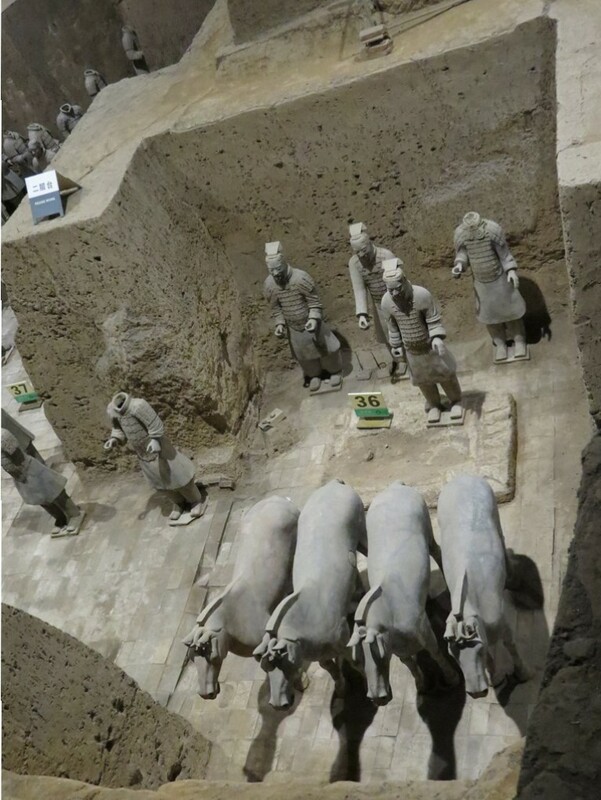 Pit 1 is the original discovery, the largest collection of figures, and the collection that has been most reconstructed. We started there, and walking in the front entrance one is immediately greeted with the most amazing sight. Panorama of Pit 1. 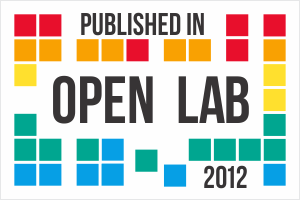 Be sure to click and look at the picture full size. Warriors, marching in formation, almost as far as the eye can see. There was a big crowd at this end of the pit, which gives the best view of the warriors. I patiently waited for there to be an opening, and then took as many photographs as I could. 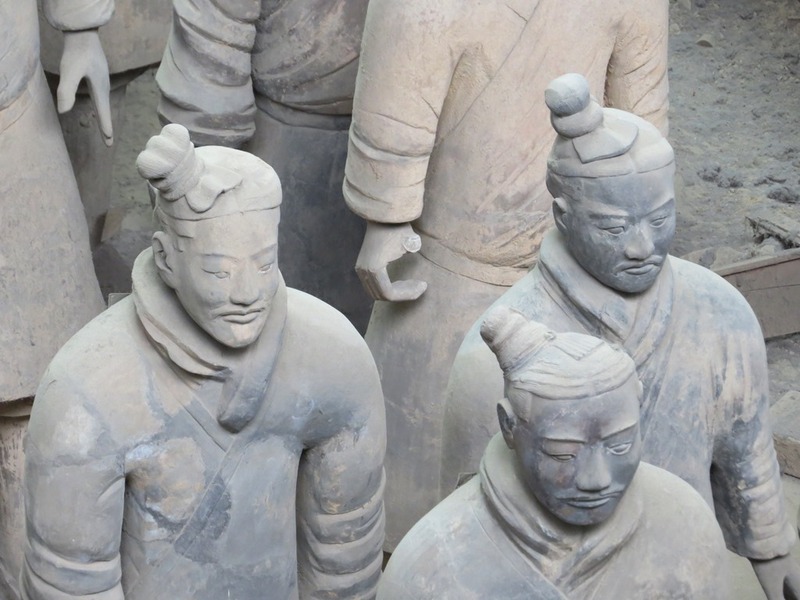 Detail of one formation of Terracotta Warriors. This image shows one of the truly remarkable things about the Warriors: every one is different. According to Wikipedia, the separate pieces of the figures — heads, arms, legs, torsos — were manufactured separately, in an early form of assembly line, but eight face molds were used and each figure had unique features added with clay afterwards. Each warrior therefore has his own look, even personality, and it makes them seem molded from life. Long shot of two rows of soldiers. You will probably notice that the soldiers have empty hands. 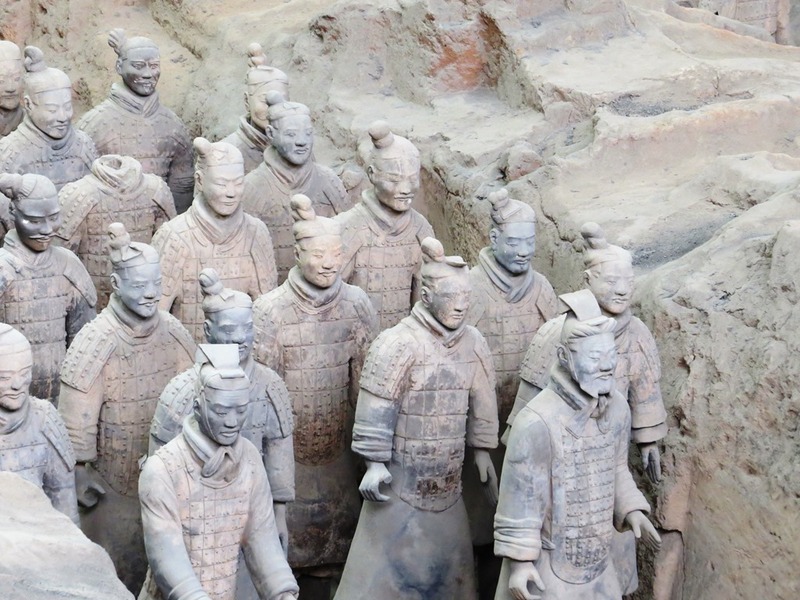 Originally, all of them would have had appropriate weapons, but many of these were probably looted after the death of the Emperor. Others that remained, made of wood, would have rotted away long ago. 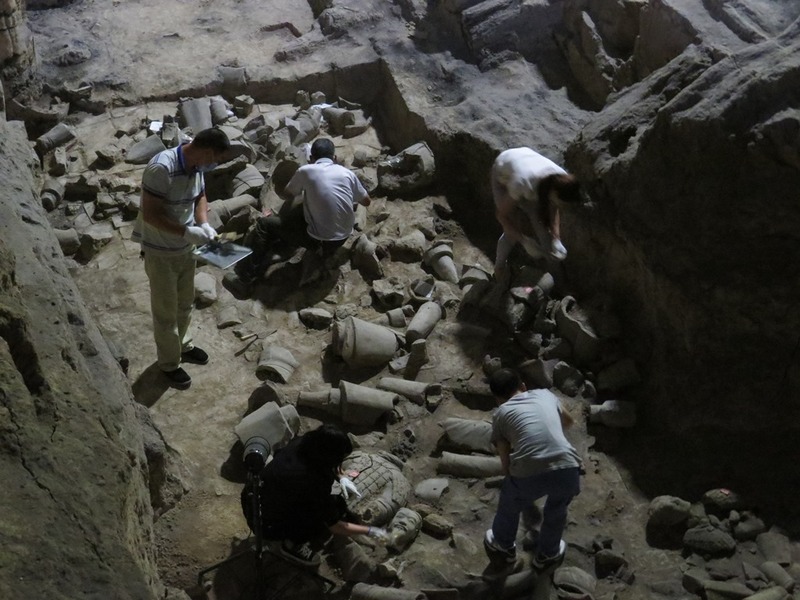 Nevertheless, a number of weapons and fragments in excellent condition have been recovered on the site. Detail of soldiers and horses. Many horses have also been found and, as I will note later, remains of chariots. 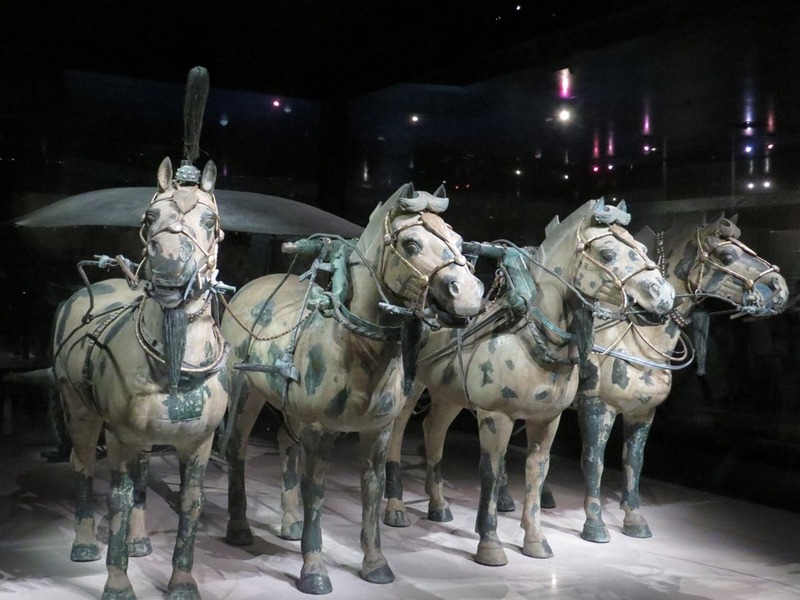 Some 130 chariots with 520 horses, as well as 150 cavalry horses, are estimated to be present. 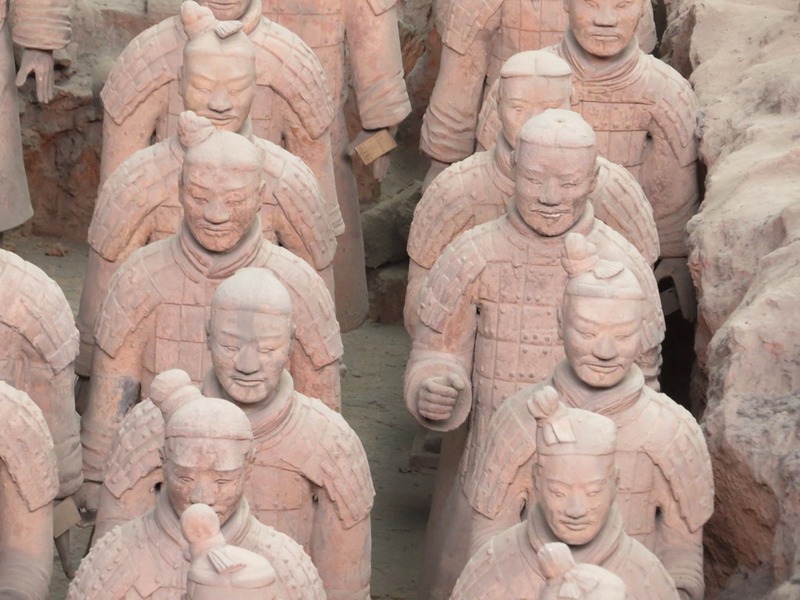 Close up of a group of Warriors. Note the incredible variety of faces and hair styles. Many of my pictures show the figures with a reddish hue. I think this is an artifact of the relatively low lighting in the building, as they did not appear red in person. Officer leading a formation of soldiers. Many heads seem to be missing, even on apparently completed figures. Talking with Taco about it, we wondered if the heads of the Warriors were deliberately destroyed by vandals. It would be a symbolic way to destroy their spirits and show disrespect for them. I could hardly tear myself away from looking at, and photographing, the figures. The variety of faces made every one feel like a new discovery. Warriors emerge from the very earth itself. As I noted, the Warriors have long been buried in hard-packed soil. 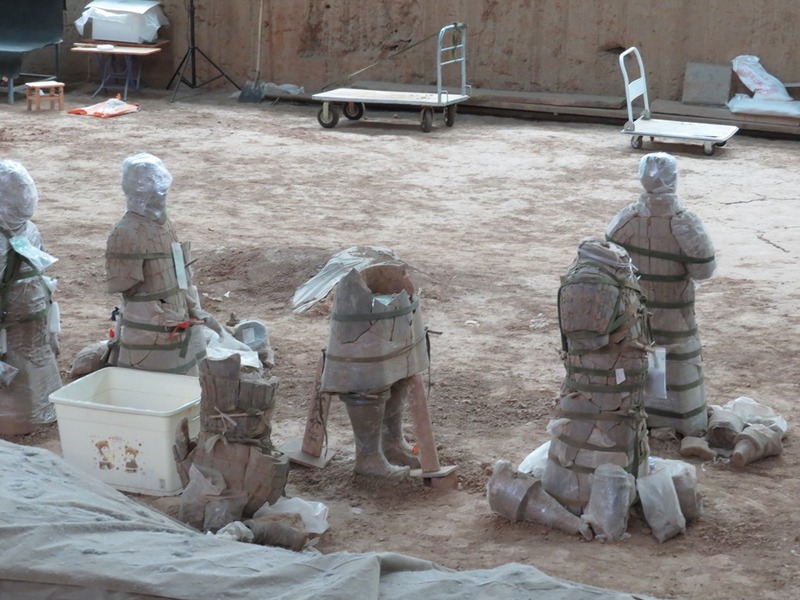 With the excavated and reconstructed figures standing in place in front of unexcavated pieces, it often looks as if they were marching directly from the earth, putting themselves back together as they march. Panorama view of the previous figures, with others surrounding them. Have I mentioned how amazing the faces of the Warriors are? Well, here are some more. Below is a closer look at what looks to be a higher-ranking officer in the front of a back that we saw earlier. Another look at what looks to be an officer leading the pack. Here are a few more faces up close. Again, note how different they are from those seen earlier. 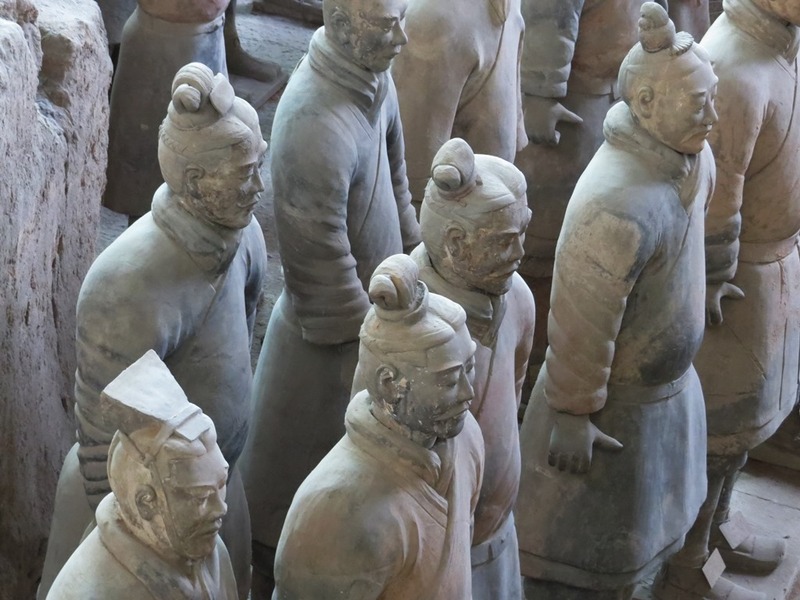 It is really difficult to convey through photos how awe-inspiring the Terracotta Army is in person. 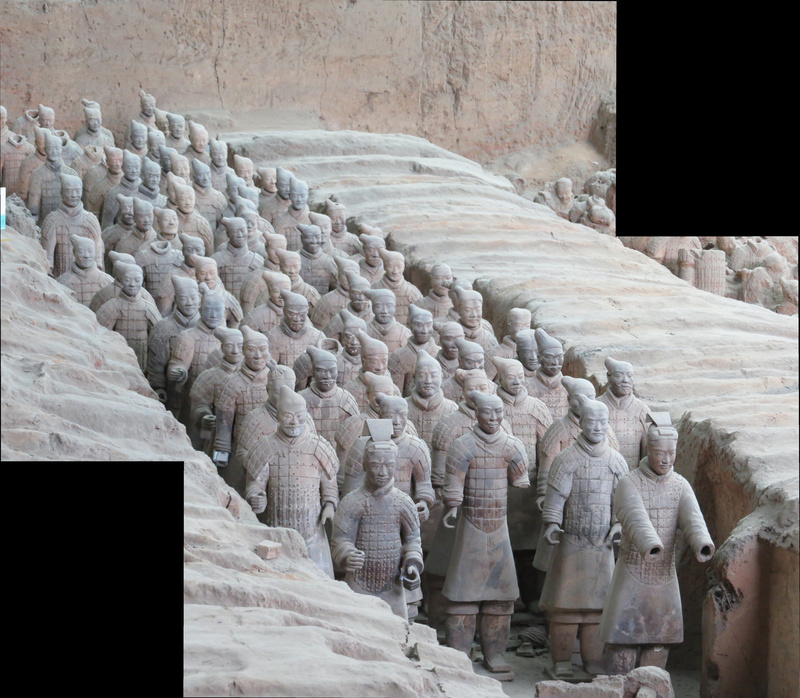 Whenever possible, I tried to take panorama photos to capture the number of figures and the size of the formations. 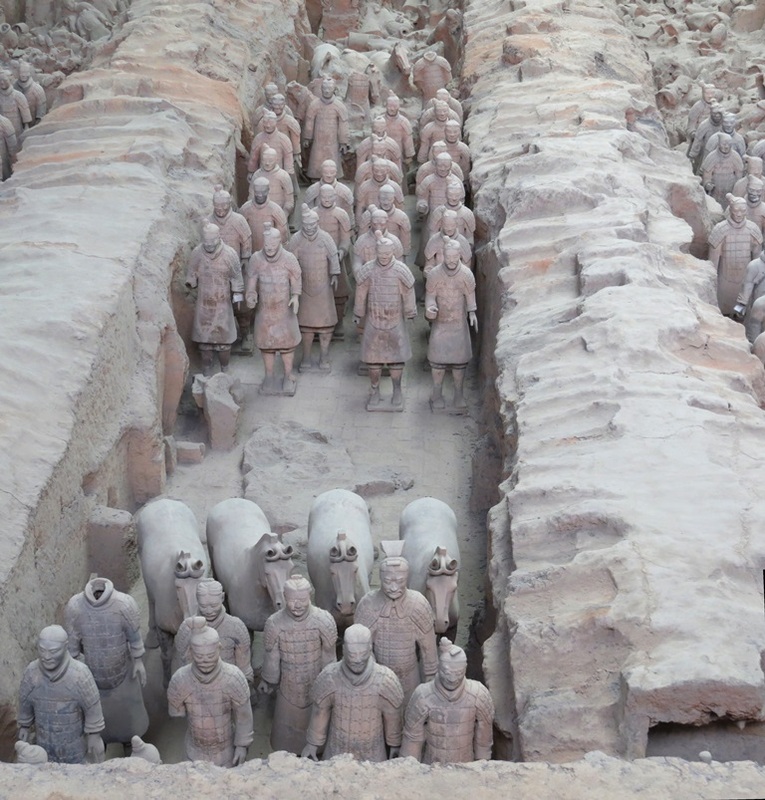 Panorama of a column of Warriors. All the pictures so far were taken just from the front of Pit 1! Circling around the building gives a different perspective of the Army, though an equally impressive one. 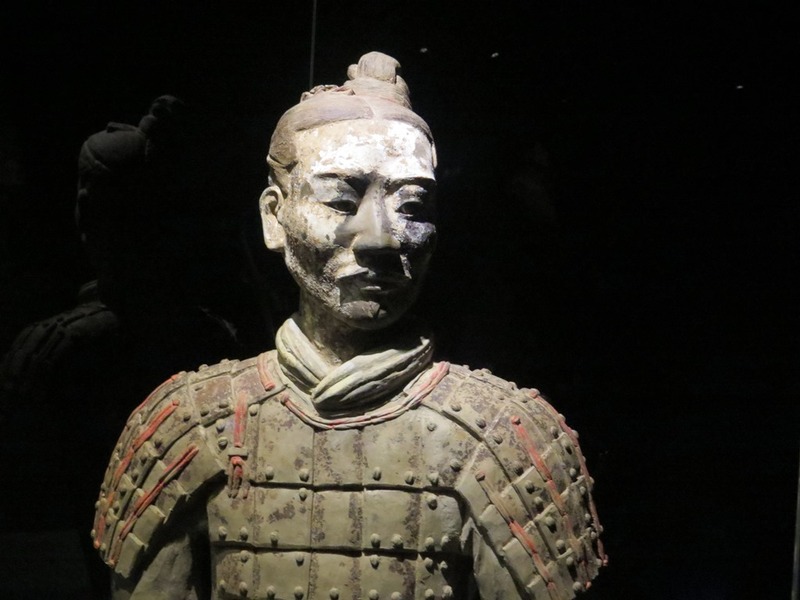 Terracotta Army, a side view. The side view of the Warriors gives a better impression of their true three-dimensional nature. No cardboard cutouts are these! Detail of some Warriors from the side. Once away from the front entrance, you can see the very spot where the farmers discovered the Army in 1974. 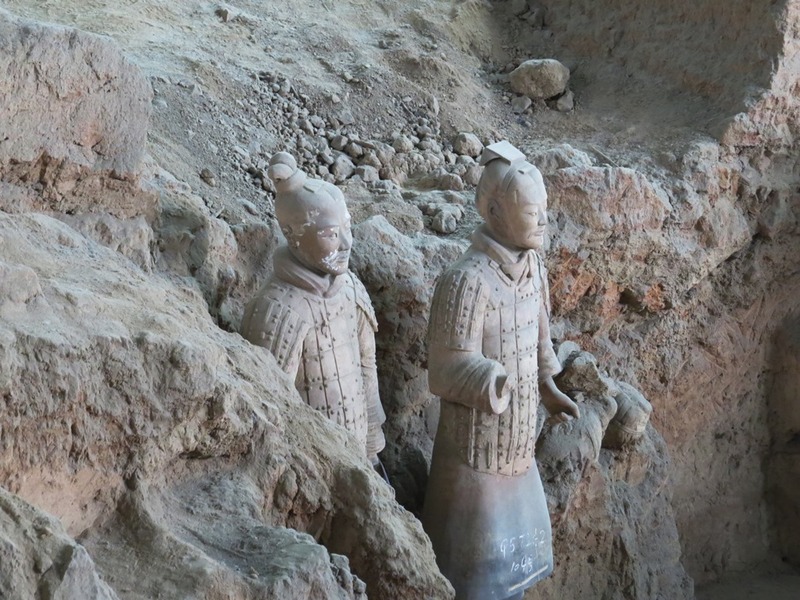 Exact spot where farmers drilled a well in 1974 and inadvertently discovered the Terracotta Army. Here’s even more of the Warriors, up close. More Warriors marching from the earth. 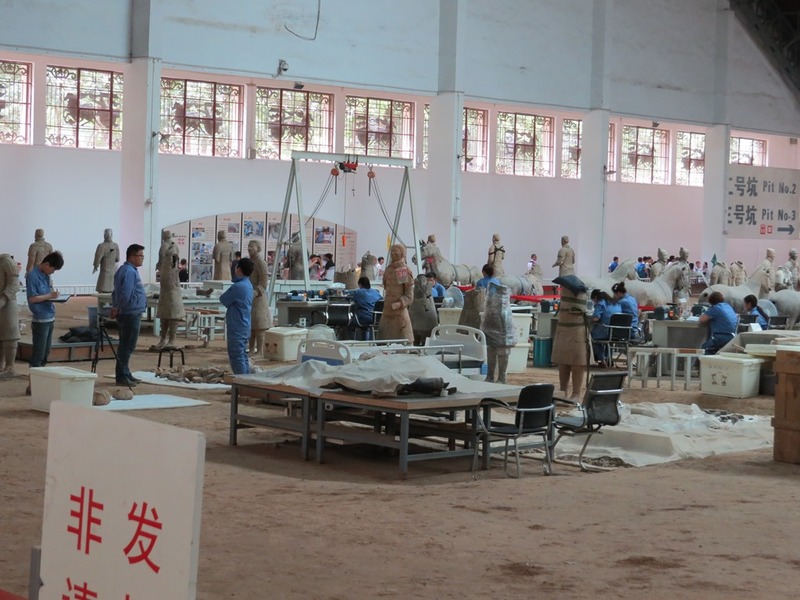 A variety of different workshops fashioned the figures, and one would expect that there would be some variation in their quality. Some, like the following, appear almost cartoonish. 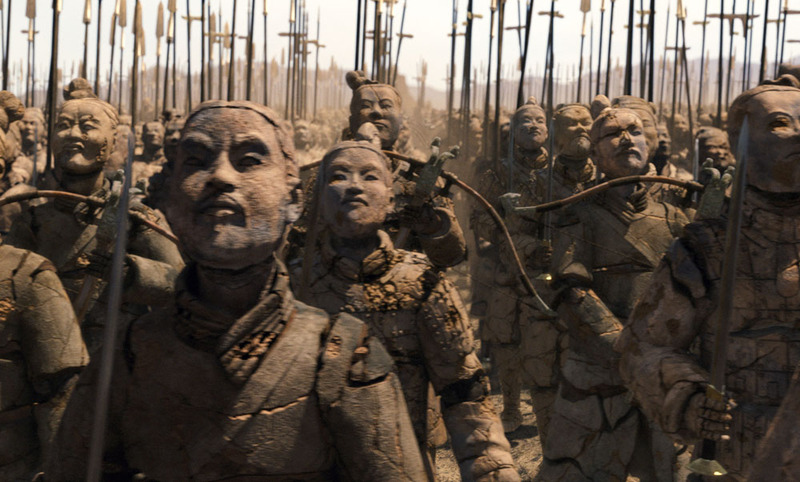 Near the back of the reconstructed Warriors, it appears even more like they are marching directly from the earth. More of the Emperor’s army marches from the earth. 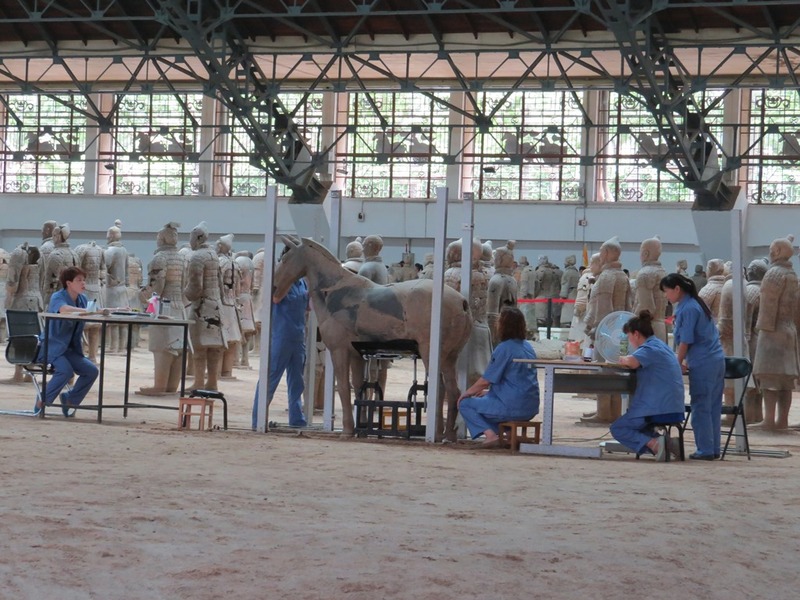 Near the back of the Pit 1 building, warriors and horses are being actively reconstructed. On display are many of the partially completed figures. We weren’t quite sure why the figures were wrapped in plastic. Our best guess: the fixative used to put them back together may dry quickly in the air, and therefore dry much more quickly on the surface than underneath. By wrapping the figures in plastic, the fixative would presumably dry more evenly. 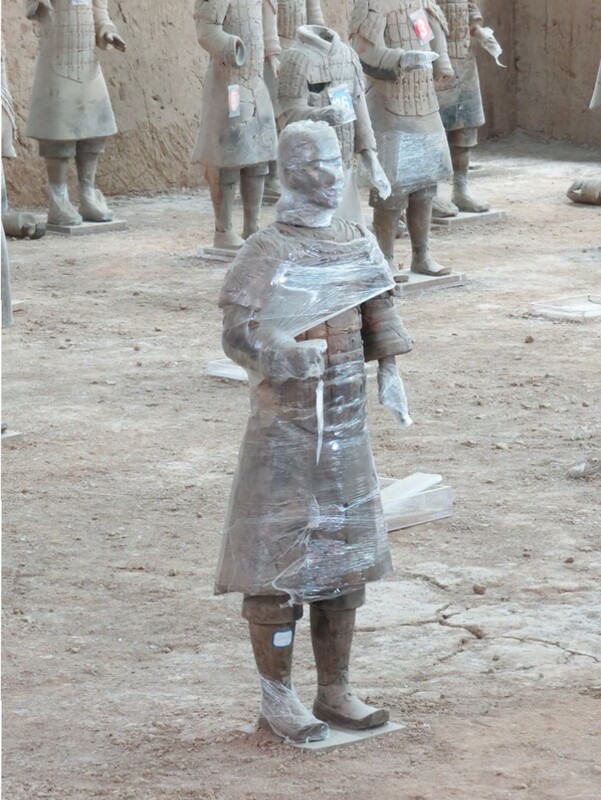 Later, in the museum, we would find just the head of a Terracotta Warrior wrapped in plastic, making it look the the aftermath of some sort of mafia hit job and disposal! 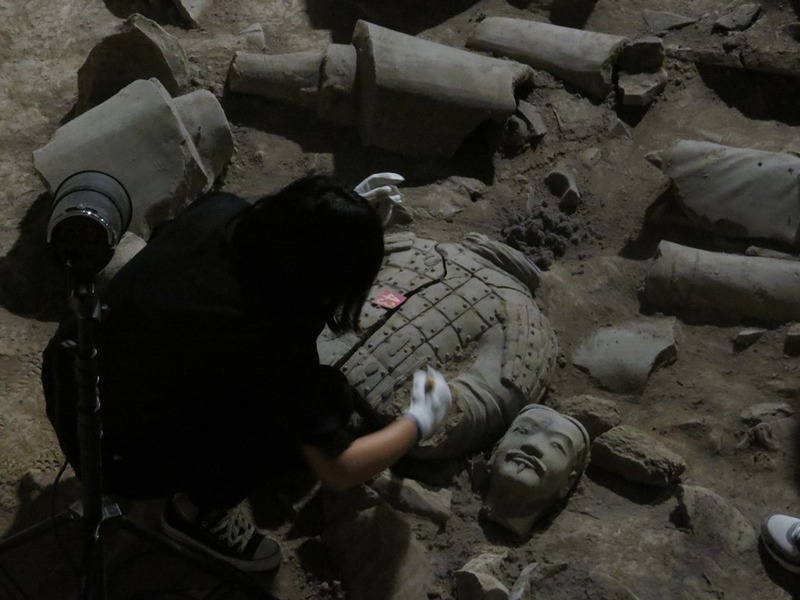 Other figures remained in pieces, in the process of reconstruction. It was here that one could really begin to appreciate the amount of effort required to just get a single soldier back into the Army. Piece by piece, they are put back together. Recently repaired figures were standing at attention, seemingly eager to rejoin their compatriots. It was a particularly nice treat to see workers in the process of reconstruction. I can only wonder how many people are employed in excavating and repairing the Army. Reconstruction team, working on Warriors. 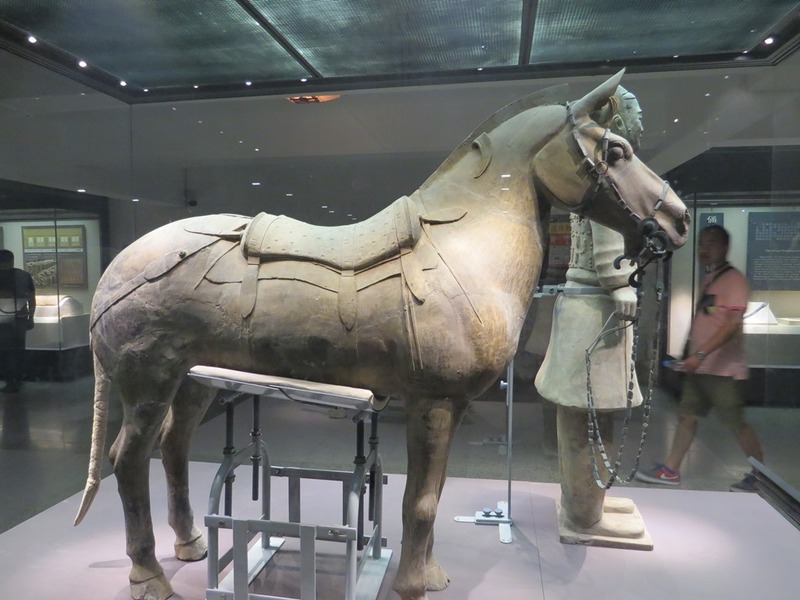 I also felt quite lucky to be able to see a horse figure under reconstruction. Note the support under the horse’s midsection; it must be a challenge to not only reassemble the figures, but make them strong enough to support their own weight again. 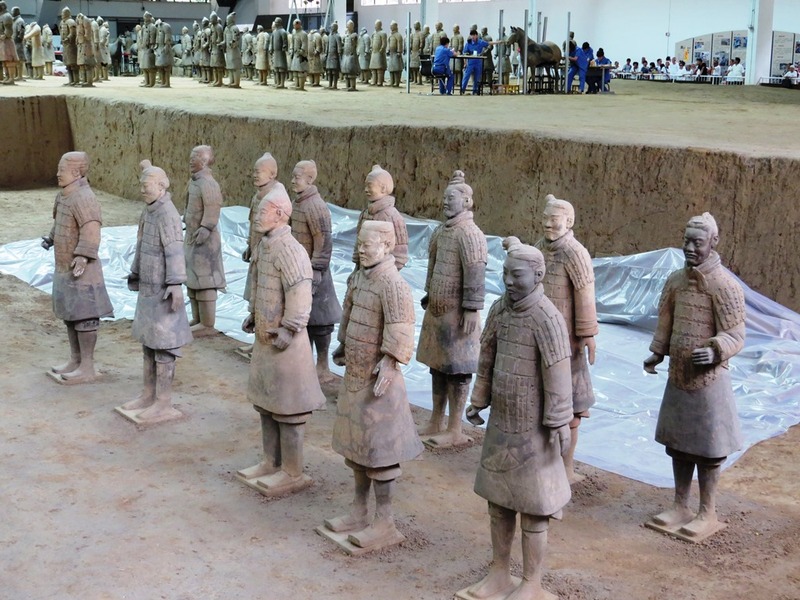 Adjacent to the reconstruction area, a group of figures stood silently at attention. I assume that these were recently completed or almost completed figures, ready to rejoin the ranks. At this point we had gone over halfway around Pit 1. On this second side, the right side from the entrance, were areas only partially excavated. I readily found myself pondering the impermanence of humankind’s works while looking down at the partially buried figures. Warriors waiting to be freed. 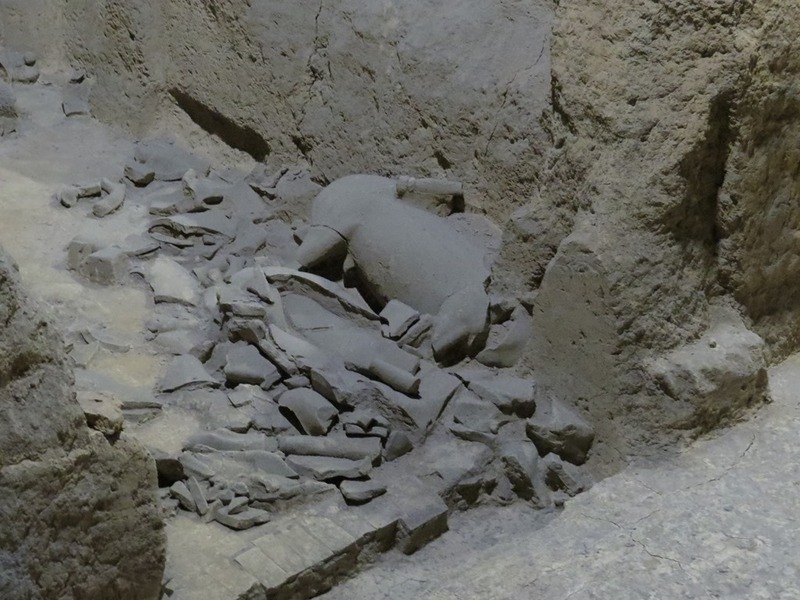 On this side, there were workers slowly excavating new figures from the hard-packed earth. The worker in the photo below seemed to be digging out a soldier’s armor, though it was difficult to tell. Careful unearthing of a figure. I found the partially uncovered figures to be just as compelling, or sometimes even moreso, than the figures perfectly repaired. It is somewhat odd to think that, years from now, this scene will be gone and the figure will be standing in the ranks. Having made a complete loop of Pit 1, we moved on to the Pit 2 building. Archaeological work at Pit 2 started a number of years after Pit 1, and it appears to be still quite untouched, though this appearance is deceiving, as we will see. 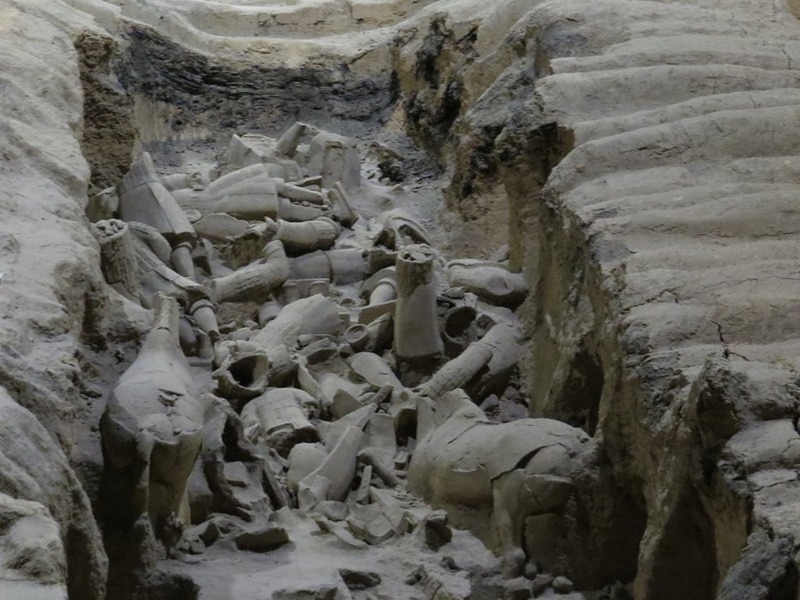 Fragments of warriors and horses lie scattered where they were uncovered, looking like the casualties in a particularly vicious battle. Pit 2 remains of a battle. We passed along the left side of Pit 2, but there was not much to see on this side other than remains. We opted to move on to Pit 3, which as I have said was behind Pit 2, and circle back through on the way back. Pit 3 is the smallest of the three, and contains a small number of figures. However, it was evidently the “command pit,” containing high-ranking officials and a war chariot. The chariot has evidently not been reconstructed (if anything remains), and it appears instead like a ghost chariot. One group of figures, mostly without heads, had been arranged “facing” each other, giving the appearance of a phantom conversation. From the other side of the pit, one gets a better view of the horses that pull the ghost chariot. Side view of the horses pulling the ghost chariot. So where, exactly, are the war chariots? I didn’t see any reconstructed ones, but traces of them remain. Below is a photo that shows the remains of a chariot wheel that I saw back in Pit 2. 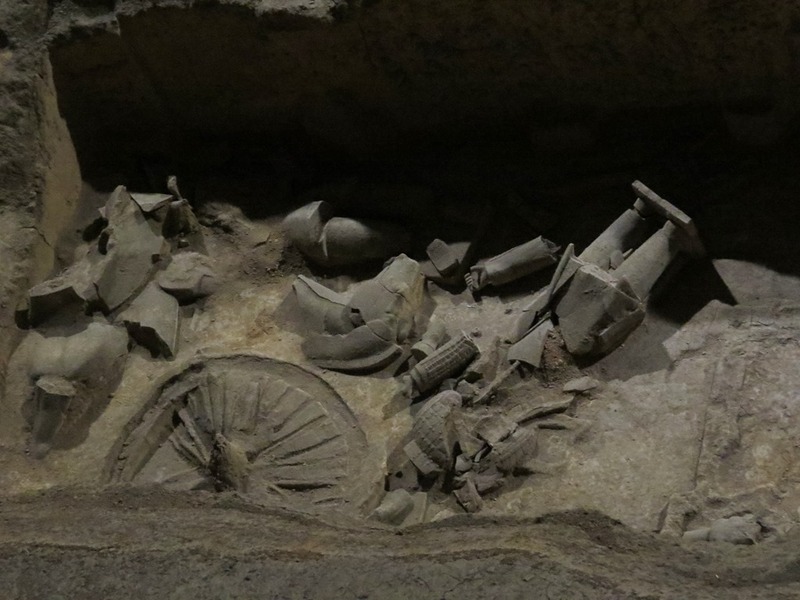 Fragments of horses, warriors, and a chariot wheel. 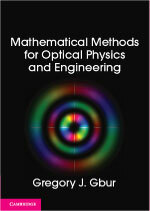 Have I mentioned that the Chinese are clever people? 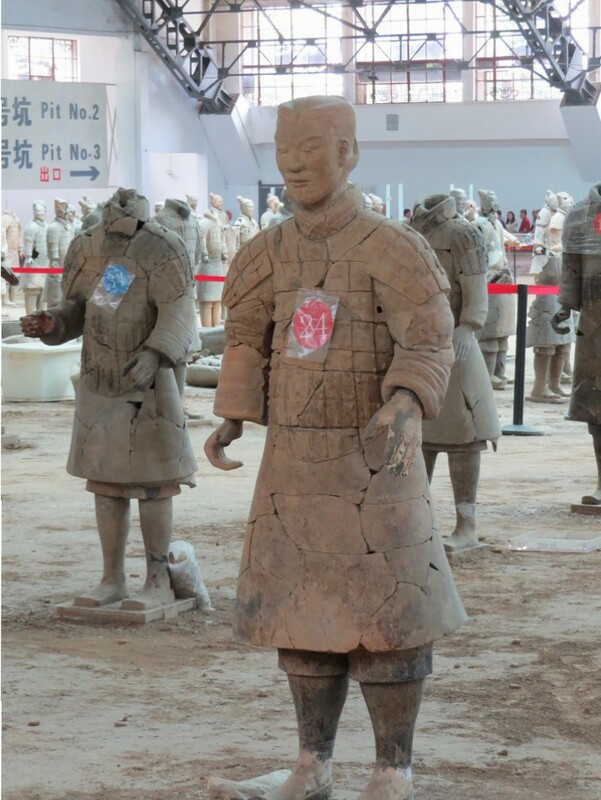 In the Pit 3 building, you can have your picture taken and merged onto the body of a Terracotta Warrior, for a price of course. No I didn’t do it. It was a bit much, even for me. It is worth sharing a photo of the Pit 3 Building, to show how elegant a home the Chinese have built for their relics. Entrance to the Pit 3 Building. Passing back into the Pit 2 Building, we passed along the other side. 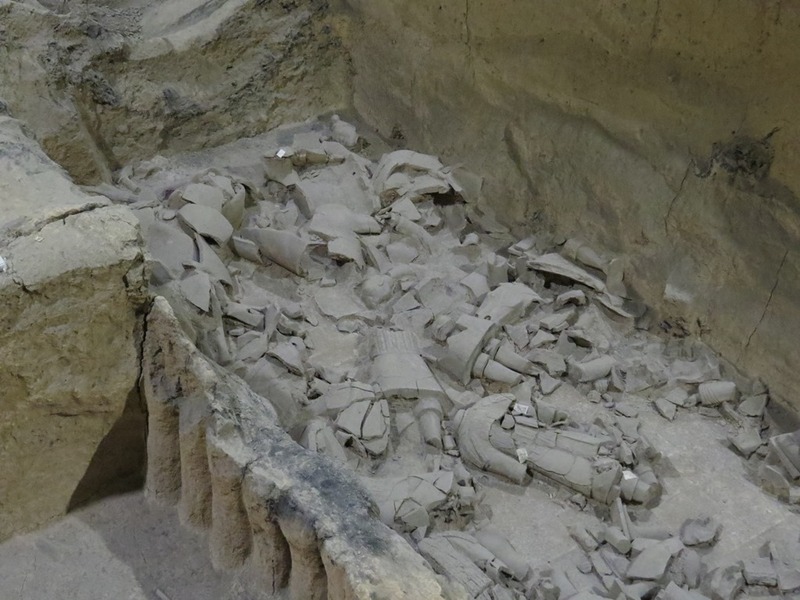 More of the terracotta remains had been uncovered on this side, but still looked like a massacre long past. After the Battle of Pit 2. This side of Pit 2 also, however, contains some of the most unique figures, reconstructed and up close. The first of these was a kneeling archer. The archers were found in Pit 2, and 160 kneeling archers were uncovered. Much rarer is the next figure, a high-ranking officer. Only seven of these high-ranking officers have been found. The style of clothing and ornate knots on the clothing indicate the high rank. He can be compared with the middle-ranking officer that was on display beside him. 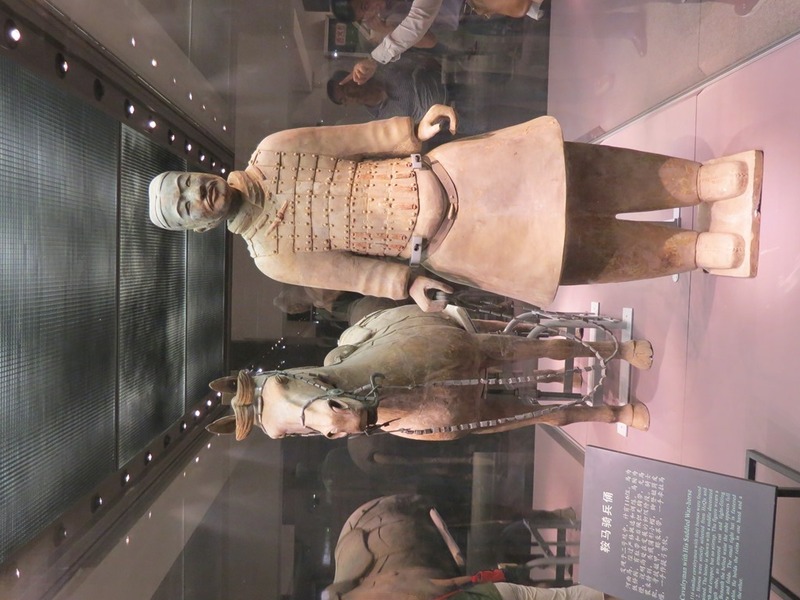 The most impressive figure on display, however, was the cavalryman and his horse. The horse is wonderfully detailed, as this side view shows. Side view of the cavalry horse. 116 similar cavalrymen with horses were found in Pit 2. The final figure they had on display is one I like to call “kung-fu archer,” though he is actually a standing archer, missing bow and arrows. 172 standing archers were found in Pit 2. “Kung fu archer.” As a bonus, I captured a young lady mimicking his pose for a picture. Perhaps the coolest thing about Pit 2, however, is something quite new. 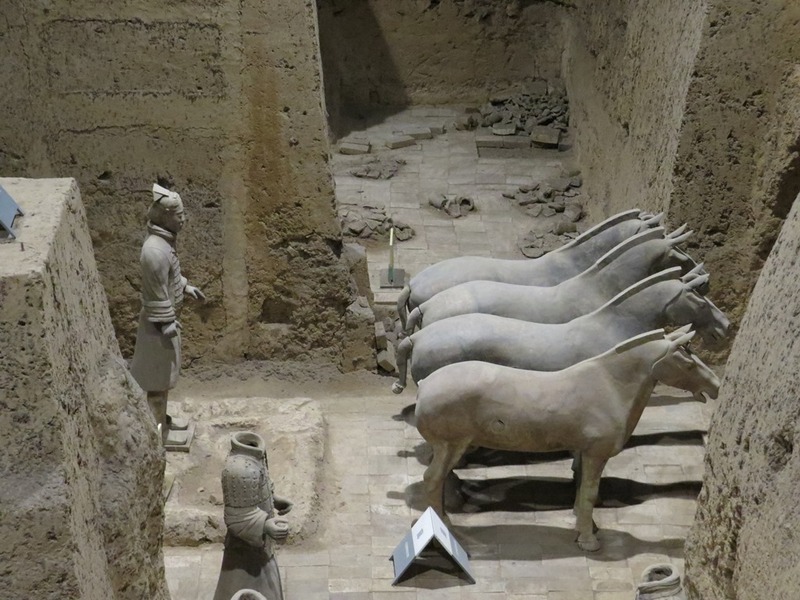 A month before I made my trip to China, I became almost ecstatic upon learning that new excavations in Pit 2 have begun, and that I might have the chance to see this work in person. I was not disappointed! 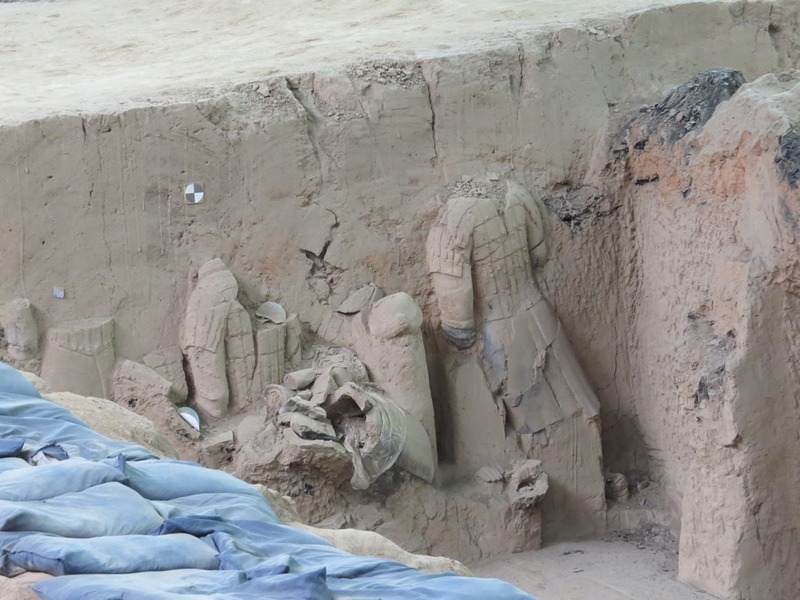 Workers uncovering new figures in Pit 2. The woman in the lower left corner of the photo was carefully cleaning off the head and torso of a Warrior, and the following pictures of her at work are perhaps my favorite of my entire collection. Warrior excavation in progress, photo 1. Warrior excavation in progress, photo 2. Something about the lighting in this image, and the clear view of the warrior and the work being done on it, really resonates with me. Perhaps it is symbolic of new China connecting with the China of old? In any case, there is clearly still much, much work to be done. Much work remains to be done. Who knows how long it will take? At this point in our visit, we had been around all the army pits. However, we still had the museum to explore, which held even more surprises. 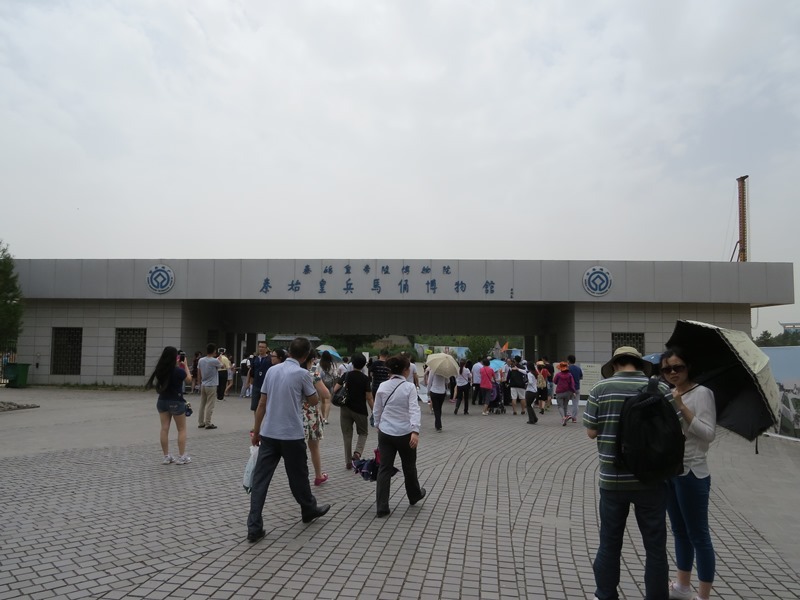 Front of the Terracotta Army Museum. 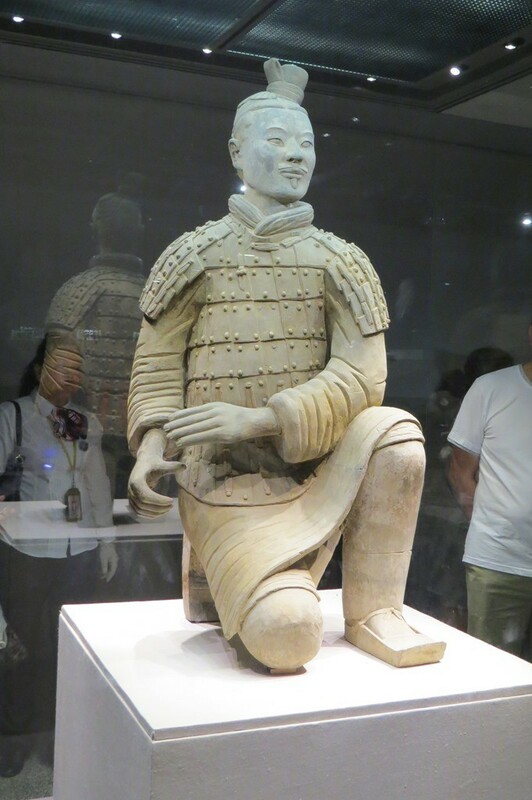 You would be forgiven at this point if you assumed that the Terracotta Warriors look now very much like they did back when they were made. This is what I thought. In fact, however, the Warriors were originally very colorfully painted! This paint has been mostly lost through time and the elements, but a few figures have been uncovered that retain tantalizing glimpses of their original coloration. The museum has many of these figures on display. I was rather surprised that the security guards weren’t preventing anyone from taking pictures. I assumed they allowed photos provided a flash wasn’t used, and I of course wasn’t using one. 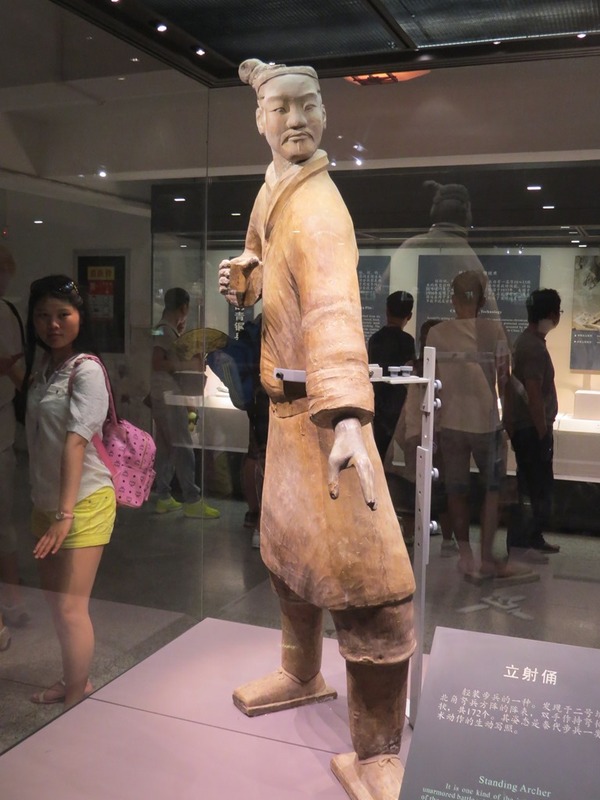 It turns out the Terracotta Warriors are not the only figures that were made for the Emperor. Closer to his mausoleum proper, excavations have uncovered many other figures, including animals, acrobats, and public officials. One of the latter was on display in the museum. So what did the Warriors look like when first completed? Researchers have determined what the original paints were, and have reconstructed the original appearance of several of the figures. There was still one more set of wonders to be seen in the museum. 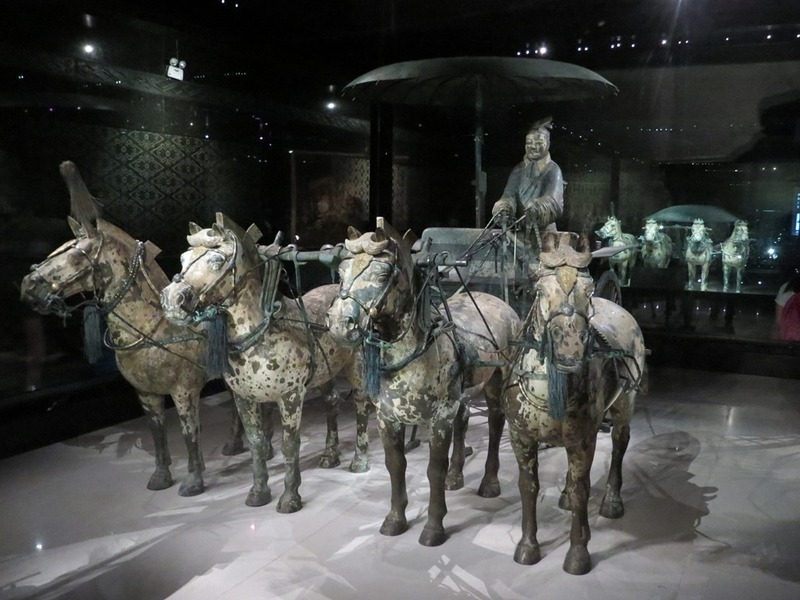 Excavations near the Emperor’s tomb also uncovered a pair of bronze funeral chariots, which are in amazing condition. 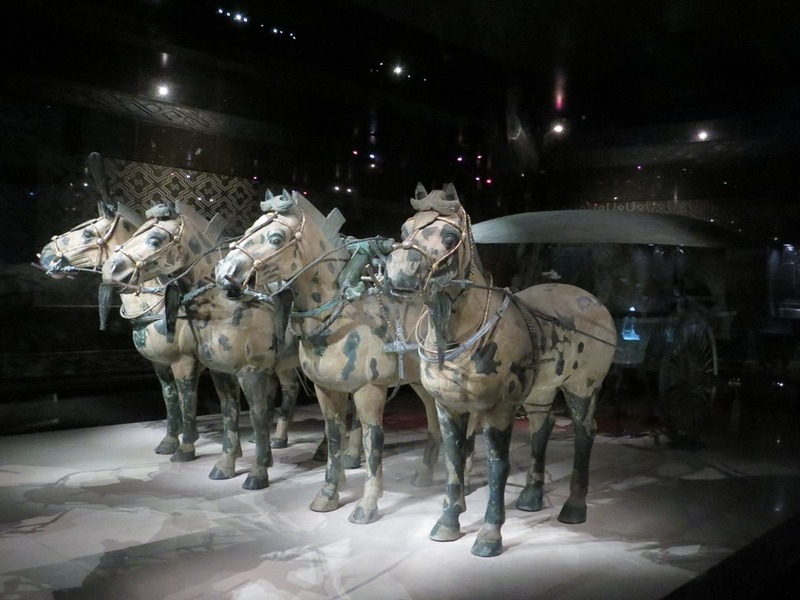 The chariots are not life-size like the Terracotta Warriors, but maybe 1/2 size. 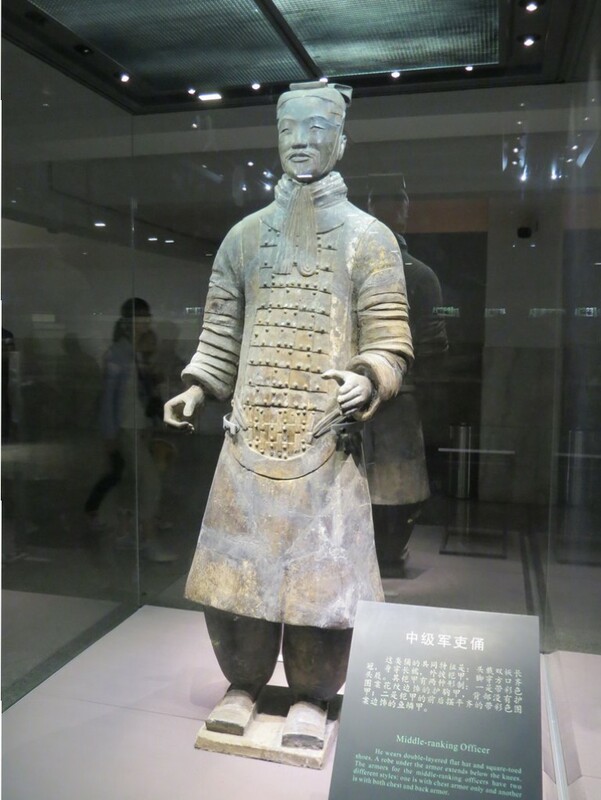 Apparently there was some limit to what the Emperor’s craftsman could build in bronze? The second chariot was lower, and appears to be the one intended to hold the body of the deceased. The details on the chariots, people and horses were amazing! Here is another look at the horses of the second chariot. And here’s a close-up of the driver of the first chariot. The driver of chariot 1. He’s looking pretty good for 2000 years old. And with this, we had seen pretty much everything to be seen! I could easily have stayed another few hours and gone back through, examining the warriors in more detail, but it was getting late and it had already been a long day. On leaving the museum, I took one final panorama of the complex. The Terracotta Army complex, seen from the museum. The curved building on the right contains Pit 1. 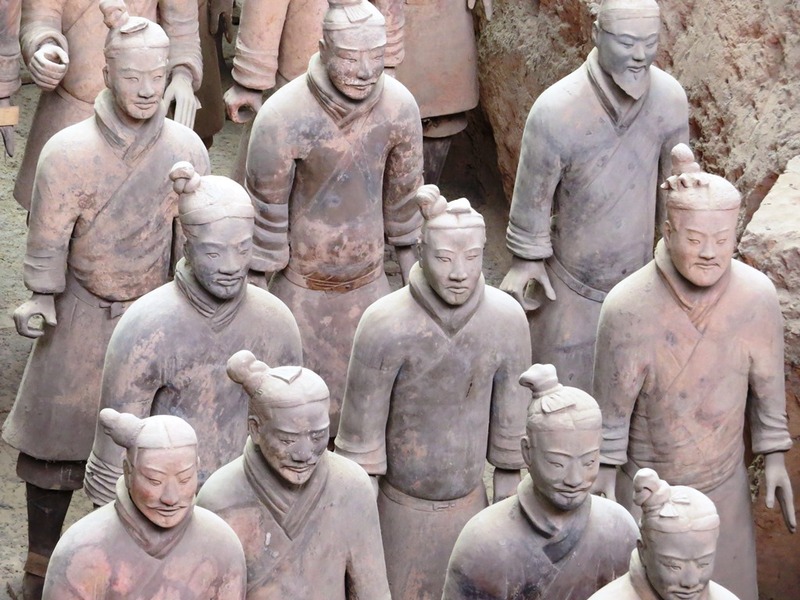 As I’ve said, visiting the Terracotta Army fulfills a near-lifelong dream of mine. 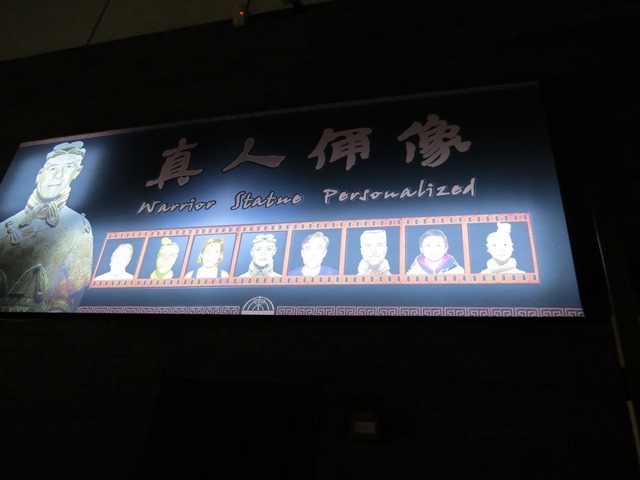 I would happily go back to see it again if I return to Xi’an, and I would encourage anyone who has the opportunity to go see it as well. 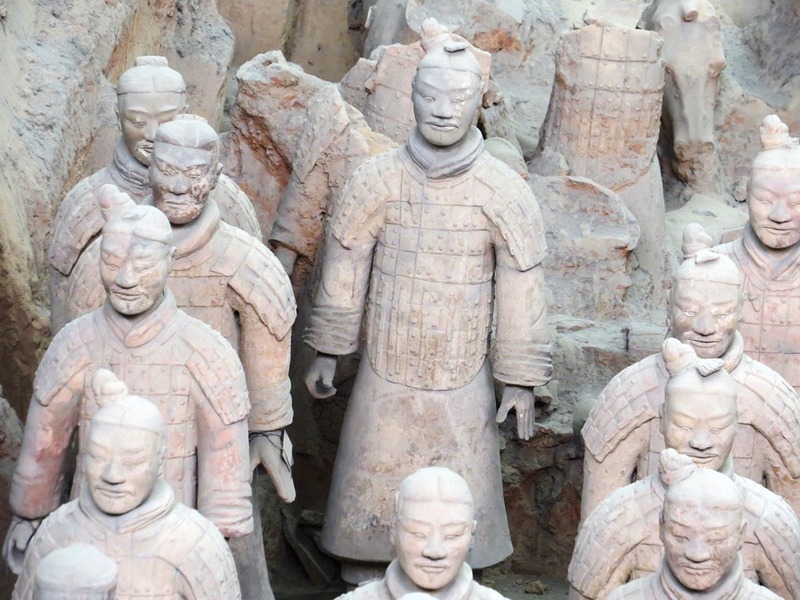 Pictures can’t fully capture the feeling of awe one has when looking on the silent army of Qin. 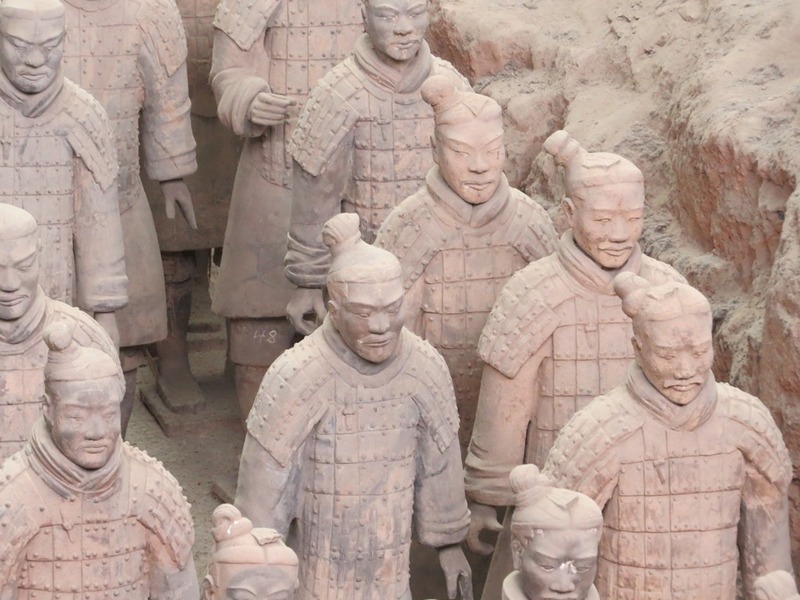 In concluding, I can’t help but note that I’m not the only one whose imagination has been fired by the Terracotta Army. It has appeared in several movies and video games to a greater or lesser extent. 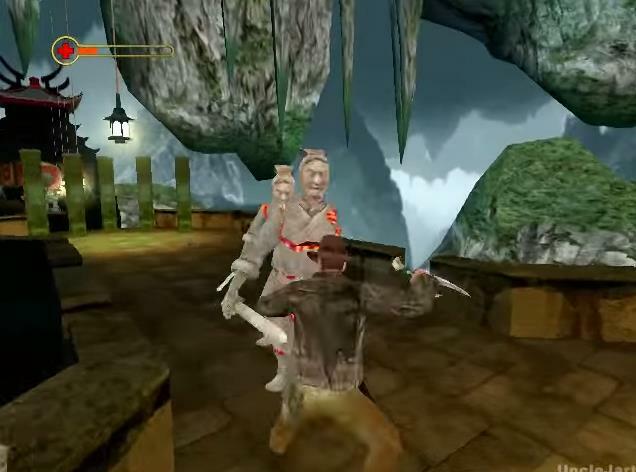 For example, in the 2003 movie Lara Croft Tomb Raider: The Cradle of Life, Lara deals with a black market dealer who has a stolen collection of warriors for sale. More recently, the Warriors took a more active role as the undead servants of the resurrected (and evil) Emperor, in The Mummy: Tomb of the Dragon Emperor (2008). I happened to see this movie on television just before I left for China, and I joked that I was watching it to prepare for my trip. In the 2003 videogame Indiana Jones and the Emperor’s Tomb, Indy races to find the tomb before the Nazis. 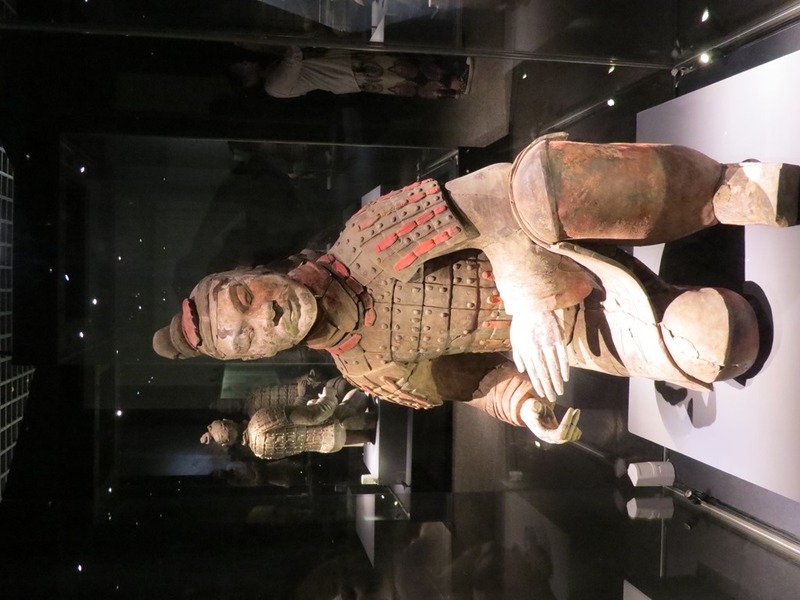 Along the way, he battles animated Terracotta Warriors. A much more mellow game appeared in 1995. 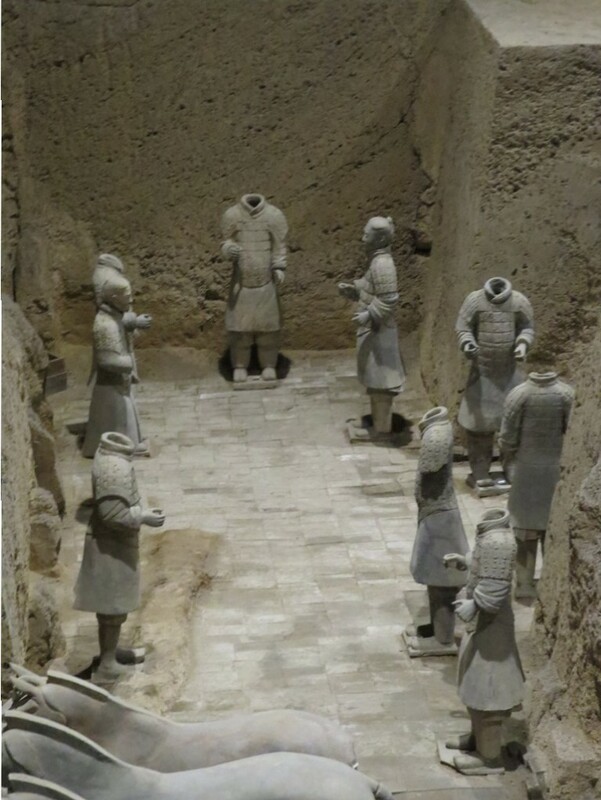 In the puzzle game Qin: Tomb of the Middle Kingdom, the player takes part in an excavation of the tomb, and along the way passes by the Terracotta Army. I’ve seen/played all of these, but nothing compares to the real thing. 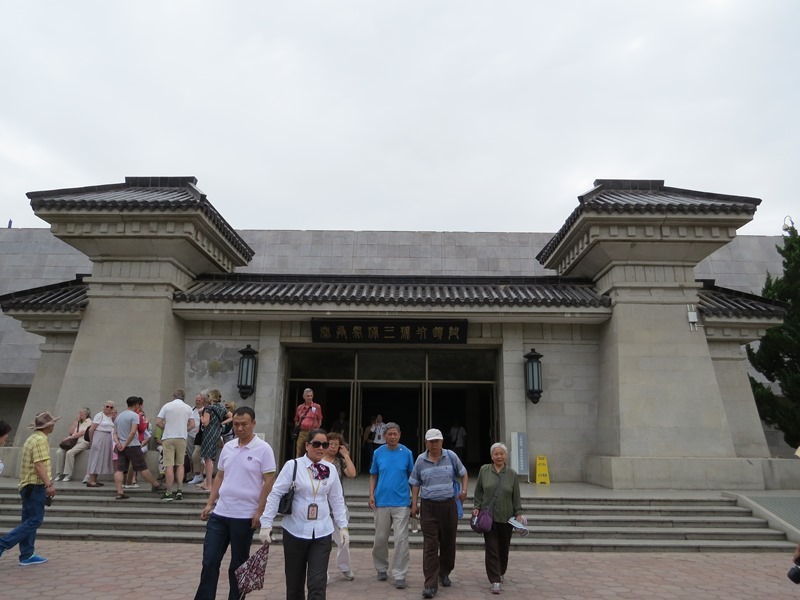 I’ve still got more China adventures to blog about! 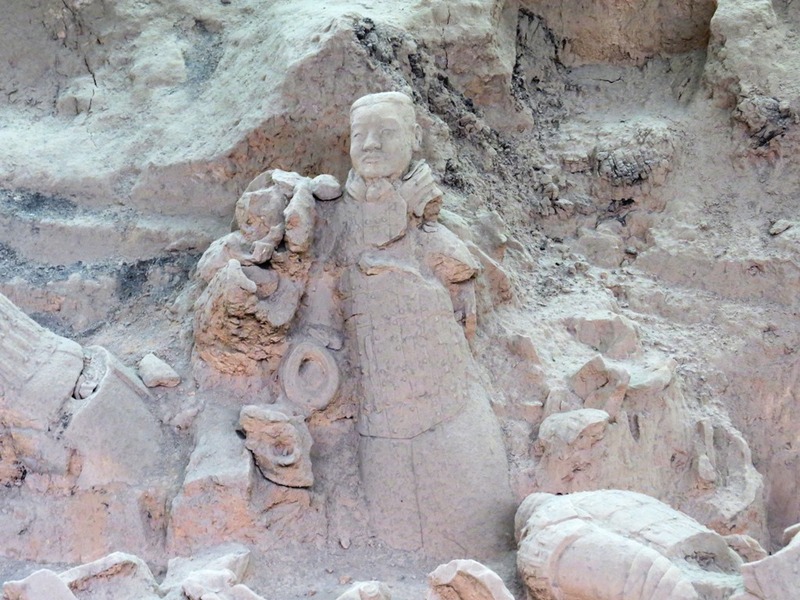 In my next post on China, I’ll talk about my visit to the site where the famed Silk Road began. Wow! That’s pretty amazing. Thanks for sharing this. 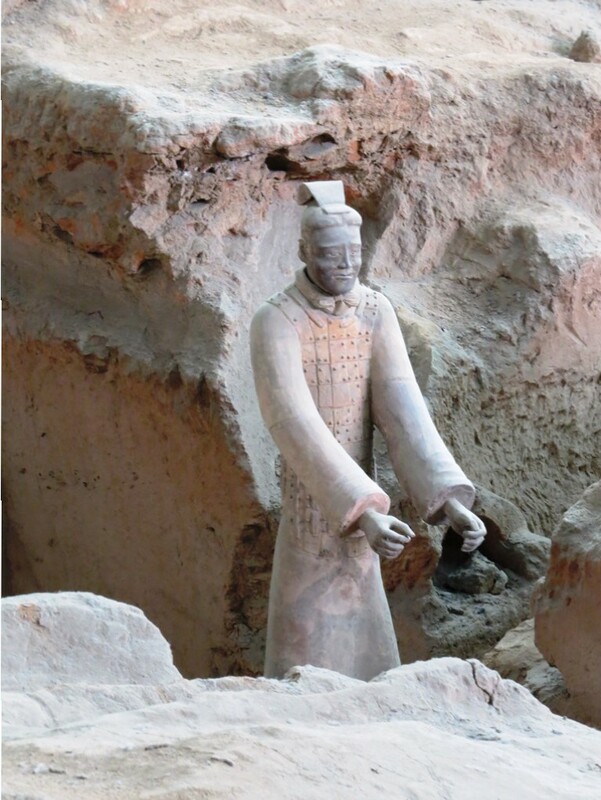 China has some fascinating history. Great photos, thanks for sharing. I dig the full-color warriors too.